FULTON – Students who complete the 10-week Advanced Manufacturing Program at Cayuga Community College’s Fulton campus have the opportunity to learn life-changing skills and greatly increase their earning potential, says a former student who graduated from the class earlier this year. 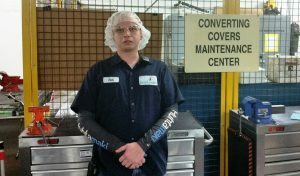 Bob Gessner, a conversion mechanic at Huhtamaki Packaging, said the Pre-Employment Advanced Manufacturing Certificate Program gave him the skills he needed to qualify for a new job at Huhtamaki. The next session of the Advanced Manufacturing Program begins Oct. 17 at Cayuga Community College. Bob Gessner, a 37-year-old conversion mechanic at Huhtamaki Packaging in Fulton, said he got more out of the 10-week class than he ever thought possible. The next session of the Advanced Manufacturing Program begins Oct. 17. Oswego County Workforce New York will hold an informational session about the program from 3 to 7 p.m. Oct. 4, at the One Stop Center located at 200 N. Second St., Fulton. Job seekers will be able to talk with One Stop staff about tuition assistance, meet with representatives of local industries, and learn about funding and other training opportunities offered through Center for Career and Community Education and Oswego County Workforce NY. The Advanced Manufacturing Program meets Monday through Thursday evenings, allowing students and their instructors to work during the day. Students receive hands-on training from local manufacturers in a variety of technical fields, such as hydraulics, pneumatics and blueprints. The students also write resumes, practice for interviews, and visit local companies to learn about employment opportunities. The course was developed by area manufacturers, the Oswego County One Stop Center in Fulton, and Cayuga Community College to meet an increased demand for workers in advanced manufacturing positions in local industrial facilities. “The faculty and support staff all work full-time jobs, and then were there for us for another five to six hours a night,” he said. The program helps Oswego County residents fill the growing need for skilled manufacturing workers in the Oswego County area. Tuition for the 180-hour certificate program is $2,500. Tuition assistance is available through the Work Force office in Fulton; priority is given to low-income residents and people facing barriers to employment. Oswego County Workforce New York also offers programs to help people assess their skills, explore training options, and determine if a career in the manufacturing field is a good fit. Applicants are evaluated on a case-by-case basis. To find out more about the Pre-Employment Advanced Manufacturing Certificate Program and other career training opportunities, job seekers are encouraged to attend the Oct. 4 informational session at the Oswego County Workforce NY One Stop Center, 200 N. Second St., Fulton, or call the office at 591-9000. Refreshments will be served. Special giveaways will be available to the first 50 attendees.